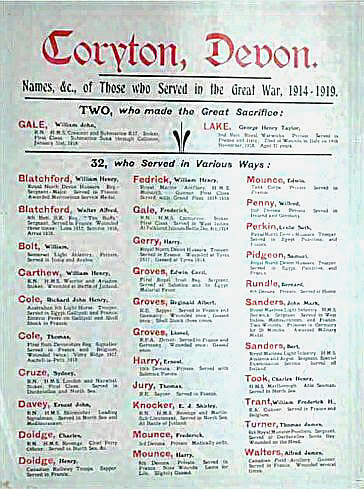 "From Coryton *thirty five men served in various ways, of which two made the great sacrifice. One from a submarine collision, and the other from wounds in Italy on November 14th 1918, three days after the Armistice. William Henry Blatchford was awarded the Meritorious Service Medal, nine men were wounded and four were gassed. John Mark Sanders was a prisoner in Germany for twenty months and was awarded the Military Medal. Twenty three were soldiers, ten sailors, one a marine, one a land worker and one a Civil Servant. Several served at the Battles of the Falkland Isles (1914) and Jutland (1916) and also in the Dardanelles." RN. HMS Crescent and Submarine K17. Stoker 1st Class. Submarine sunk through collision January 31st 1918. K/11623 Leading Stoker William John Gale. Birth registered in Tavistock in the September Quarter of 1897. Died aged 20. A Memorial Service for William John Gale was held at Coryton Church in the afternoon of 10th February 1918. 2nd Battalion, Royal Warwicks. Served in France and Italy. Died of wounds in Italy on 14th November 1918 . Aged 21 years. 43789 Private George Henry Taylor Lake. Son of Frederick Taylor and Lucy Lake of Torr Cottages, Lydford Station. 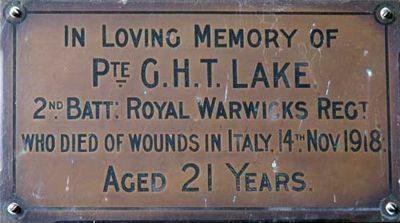 A Memorial Service for Harry Lake was held in the church in the afternoon of Sunday December 15th 1918. He died of wounds in Italy just three days after the Armistice. William Henry Blatchford of the Royal North Devon Hussars. Regimental Sergeant-Major. Served in France. Awarded the Meritorious Service Medal. Walter Alfred Blatchford - 5th Battalion the East Kent Regiment ("The Buffs") - Sergeant. Served in France. Wounded three times - at Loos 1915, the Somme 1916 and Arras 1916. William Bolt - Private in the Somerset Light Infantry. Served in India and Arabia. Stoker William Henry Carthew of the RN, HMS Warrior and Ariadne. Wounded at the Battle of Jutland. Richard John Henry Cole - Trooper in the Australian 5th Light Horse. Served in Egypt, Gallipoli and France. Suffered Enteric Fever on Gallipoli and Shell Shock in France. Signaller Thomas Cole of the 1st Battalion, the Devonshire Regiment. Served in France and Belgium. Wounded twice - at Vimy Ridge 1917 and Aschell-la-Petit 1918. Stoker 1st Class Sydney Cruze of the RN, HMS London and Narwhal. Served in the Dardanelles and the North Sea. Leading Signalman Ernest John Davey RN, HMS Skirmisher. Served in the north Sea and the Mediterranean. Chief Petty Officer Charles Doidge RN, HMS Revenge. Served in the North Sea etc. Sapper Henry Doidge of the Canadian Railway Troops. Served in France. Gunner 1st Class William Henry Fedrick of the Royal Marines Artillery, HMS Monarch. Served with the Grand Fleet 1914 - 1919. Stoker 1st Class Frederick Gale RN, HMS Carnarvon. Served in the West Indies. Present at the Falklands Islands Battle 8th December 1914. Trooper Harry Gerry of the Royal North Devon Hussars. Wounded at Ypres 1917. Gassed at Ypres 1918. Sergeant Edwin Cecil Groves of the First Royal Irish regiment. Served at Salonica and in Egypt. Malarial Fever. Sapper Reginald Albert Groves of the Royal Engineers. Served in France and Germany. Wounded once; gassed once. Shell Shock three times. Driver Lionel Groves of the Royal Field Artillery. Served in France and Germany. Wounded once; gassed once. Private Ernest Harry of the 10th Devons. Served with the Salonica Forces. Sapper Thomas Jury of the Royal Engineers. Served in France. Sub-Lieutenant Edward John Shirley Knocker of the RN. HMS Revenge and Martin. Served in the North Sea. Present at the Battle of Jutland. Private Frederick Mounce of the 2nd Battalion, the Devons. Medically unfit. Private Harry Mounce of the 8th Devons. Served in France. Nine wounds. Lame for life. Slightly gassed. Private Edwin Mounce of the Tank Corps. Served in France. Private Wilfred Penny of the 2nd Devons. Served in Ireland and Germany. Trooper Leslie Seth Perkin of the Royal North Devon Hussars. Served in Egypt, Palestine and France. Trooper Samuel Pidgeon of the Royal North Devon Hussars. Served in Egypt, Palestine and France. Private Bernard Rundle of the 4th Devons. Served at Home. Sergeant John Mark Sanders of the Royal Marines Light Infantry, HMS Berwick. Served in the West Indies, Mediterranean and France. Two Wounds. Prisoner in Germany for 20 months. Awarded the Military Medal. Bert Sanders of the Royal Marins Light Infantry, HMS Atlanta and Argon. Sergeant in the Special Examination Service. Served off Ireland. Able Seaman Charles Henry Took RN, HMS Marlborough. Served in the North Sea. Sergeant Thomas James Turner of the 6th Royal Munster Fusiliers. Served at the Dardanelles - Suvla bay. Wounded in the head. Gunner Alfred James Walters of the Canadian Field Artillery. Served in France. Wounded several times.